Runner Up! People’s Choice Award. The product our SkinStore customers swear by. 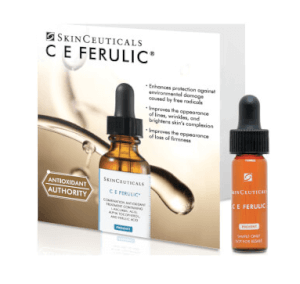 Experience advanced environmental protection with SkinCeuticals C E Ferulic; a potent Vitamin C serum that delivers visible anti-aging benefits. Free from parabens, the formula is gentle yet effective and is suitable for normal, dry and even sensitive skin types. 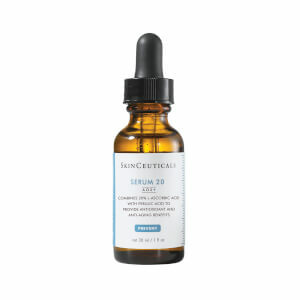 The serum delivers an array of enviable benefits that last over 72 hours. Simply smooth 4-5 drops of the fast-absorbed solution over the face, neck and décolletage. 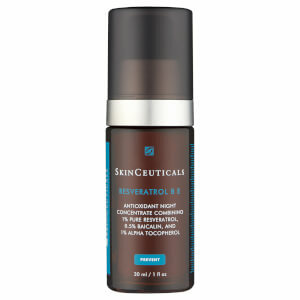 Boasting an antioxidant blend of 15% Pure Vitamin C (L-Ascorbic Acid), 1% Vitamin E (Alpha Tocopherol) and 0.5% Ferulic Acid, the daytime serum envelops skin in a protective veil. 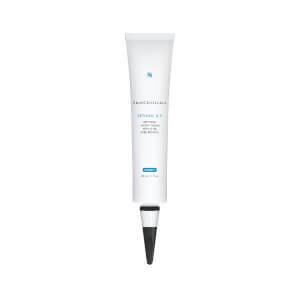 This shields the visage from age-inducing free radicals, infrared radiation and ozone pollution, which can all contribute to visible signs of skin aging. Alongside essential antioxidant performance, the C E Ferulic serum reduces current signs of aging, while visibly brightening the visage. The serum is able to reduce the appearance of fine lines, wrinkles and photodamage, alongside combating loss of elasticity to leave skin firm and youthful. Expect exceptional protection. Aqua/Water/Eau, Ethoxydiglycol, Ascorbic Acid, Glycerin, Propylene Glycol, Laureth-23, Phenoxyethanol, Tocopherol, Triethanolamine, Ferulic Acid, Panthenol, Sodium Hyaluronate. I have used this for many years and will not be without it . It is way over priced and the bottles are not even full anymore It does control the sun spots on my face. I love this product! I live in Florida and I believe it does help with antioxidants and sun protection. I get many compliments on my skin. This product gives it a beautiful, smooth glow. I’ve been using this for about 2 weeks. Haven’t really seen a drastic difference in my skin. I bought it to use for discoloration and antioxidant support. This reminds me of the brand I used Cellex C which is almost identical as this one except there is no feurilic acid in the cellex c product. We will see if there are any improvements to warrant me to buy another bottle. I’ve had results with the cellex c product so I’m thinking of going back to that one once I’ve used this one all up. Wish I had the same impact on my skin like other reviewers for this product. I’ll keep using though untill it all gone. Crossing my fingers that this will work eventually. 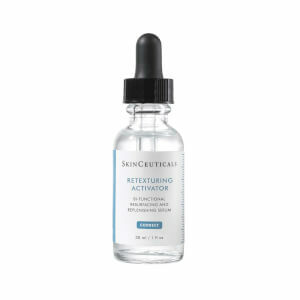 SkinCeuticals CE Ferulic is a must have in your skin care regiment. I have been using this product for years. Every now and then I switch to another product and regret it and always return CE. My Plastic Surgeon and Esthetician reminds me this a must product. I am 67. I started using this at 65. It is th e most important product for my face. My pores are smaller. My skin glows. It is soft, moist, firm and yet supple.. Put it on immedafter washing your face to trap moisture. Wait a few minutes then apply serum and moisturizer or just go straight to moisturizer. I use morning and night. Just 3 drops. Amazing. I learned about it after a facial. I learned about this product in a Med-spa. It makes a huge difference in my skin’s texture and appearance. It’s expensive but it will last about 4 or five months if you only use four drops per night. I have used this every morning for more than 20 years. I have controlled the sun spots on my face with this treatment. It is very expensive, but I have not found anything better. And trust me, I tried. I tried philosophy, kiehl’s, drunk elephant. All cheaper, because I can’t palate the cost. Yet I do. Since nothing else works so well. My face is glowing, I use it together with the 2-4-2 cream in the morning, retin-a and 2-4-2 at night. This is the most effective anti-aging product I have ever used. I have used losts of products. I ask for samples at Sephora all the time. I buy low to high end products I mostly buy lower end products. Nothing has ever worked as well. I am Sixty Three years old. I have been using this product for more than 20 years twice daily. I would not be without it. I tried another brand and the brown spots started showing up again. It is terribly expensive, but it is the only thing that fades the brown spots that I have found.